Your sister has disappeared while studying in The Magic Academy. So you enter the Higher Academy of Arwindale and begin your investigation straight away. With the help of your tutors you'll learn to take off protective spells, see the invisible things and look into the future. 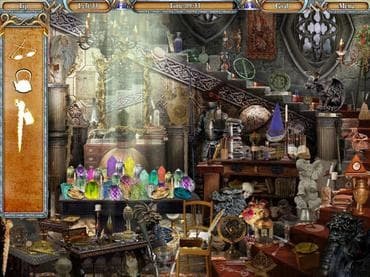 You will also meet the ghosts, find ancient spells and use magic artifacts. If you overcome all difficulties, you'll get a reward - the concealed mystery of the Magic Academy. To fulfill your mission you've got to find and match the items concealed on the background. Time is limited, so it will take all your attention and dexterity! The combination of beautiful scenes and music creates the magic and mysterious atmosphere. And the detective story will guide you through the game warming up your interest constantly. So just start playing. We're sure you'll like it. If you have questions about Magic Academy game, please contact us using this form.